This is a monthly “newsletter”, containing a list of what I enjoyed the most last month. Whether it was a full length movie, short film, music album, book or even a painting. “Random picks from all over the Internet”. This route was suggested to me by girl from Ecuador (thanks Carla), whom I met in Mexico on Dec. 10, 2017. 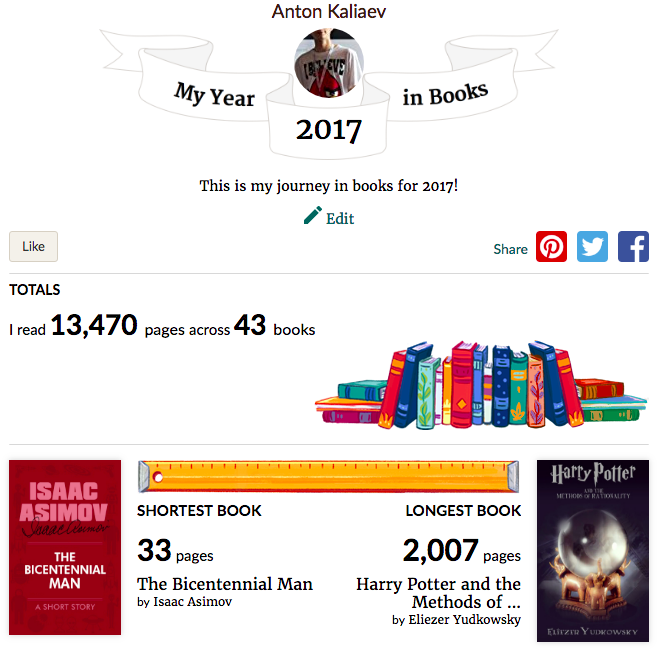 This year I’ve set a very ambitious goal for me, which is to read fifty books. And I almost did it. Never thought it would be possible to even read forty books. The key here, as many of you know, is to find one hour in evening or before you go to sleep (depending on what works best for you) and spend it reading. Audiobooks are great too!